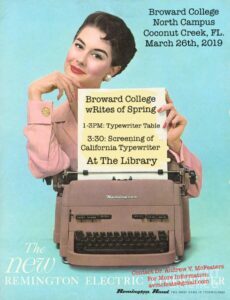 The Paper Fingers Typewriter Event is this weekend, Friday and Saturday, March 29 & 30, 2019. It has a longer title actually of “Paper Fingers – Mechanical Typewriting In The Digital Age”. Before beginning, today is AnchoredScraps daily blog post #1490. When I first began writing my blog I had one typewriter and now I have six typewriters! The Paper Fingers Typewriter Event is one of two Typewriter Events I’m seeing this week over at The Typosphere. Secondly, I’m seeing the Paper Fingers Typewriter Event listing here: Typewriter event in Rockford, Illinois. In looking for more information on the two-day event, I’m seeing alleventsinrockford mentioning the following. In conclusion, there is a joy with using a Typewriter and perhaps you’ll be able to attend one of these events, and perhaps inspire adding a typewriter to our letter writing cadre of tools! Happy Tuesday!